First unveiled internationally in 2012, the Trophy will fill in the sport touring range for Triumph India, and is expected to be launched later this year. Triumph India is gearing up to launch a new product in India, and from all indications, the new bike could be the Triumph Trophy, a heavyweight sport tourer which is already available in international markets. Powering the Triumph Trophy is a liquid cooled, 12-valve, in-line triple, 1,215cc engine, which makes 134PS power and 120Nm of torque, said to be spread out throughout the rev range. The engine is mated to a six-speed transmission with a tall sixth gear for effortless highway cruising. Power is transmitted to the wheels through a low maintenance shaft drive and torsional damping system transfers power from the gearbox to the shaft through a sprung bevel gear, and a metalastic universal joint for an exceptionally refined powertrain. The engine is mounted on a stiff, but light aluminium beam frame, for carrying heavy loads as well as enabling precise and agile handling. 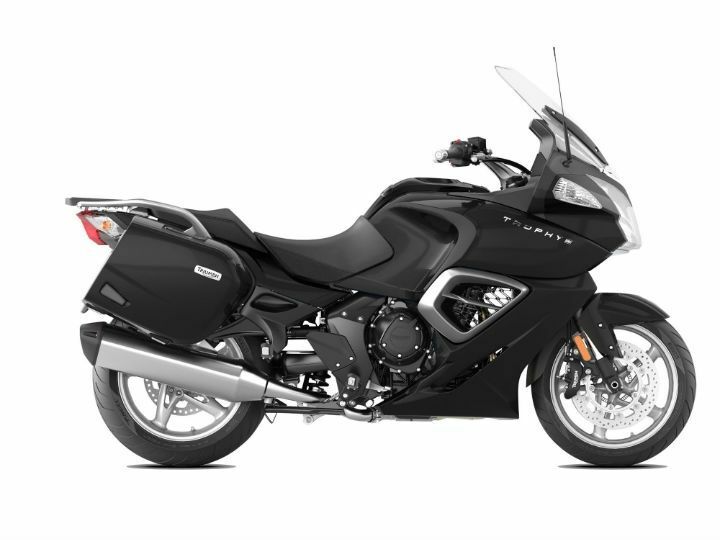 ABS is standard and ride-by-wire throttle system features electronic cruise control, and an intelligent traction control system compares the speeds of the front and rear wheels to prevent wheel slip in slippery conditions. The Trophy features Electronic Suspension for a plush ride with different settings for damping front and rear and rear spring preload adjustment too, all controlled from the switches on the left handlebar. Then there’s Tyre Pressure Monitoring System and Bluetooth audio system with a pair of 20W speakers, with digital signal processing and 3-band equalisation, and automatic volume control. Triumph’s dynamic luggage system allows small amount of independent movement which increases stability and doesn’t compromise the dynamic performance of the chassis. Additional accessories include a powered top box, high touring screen, and heated rider and passenger seats. The Triumph Trophy will retail in the region of Rs 20-22 lakh (ex-showroom).